Hi Everyone! 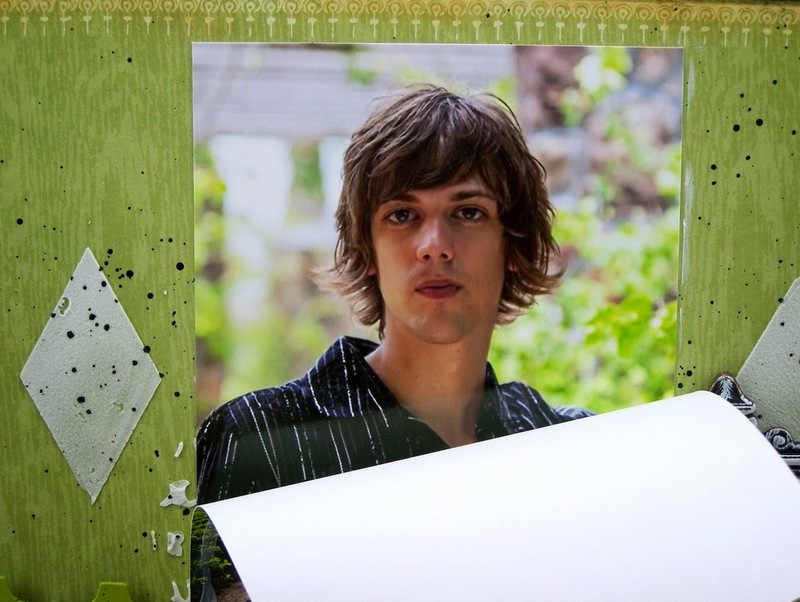 It's Sue L. here today to show you a layout I made of my son for his 23rd Birthday on June 18th. 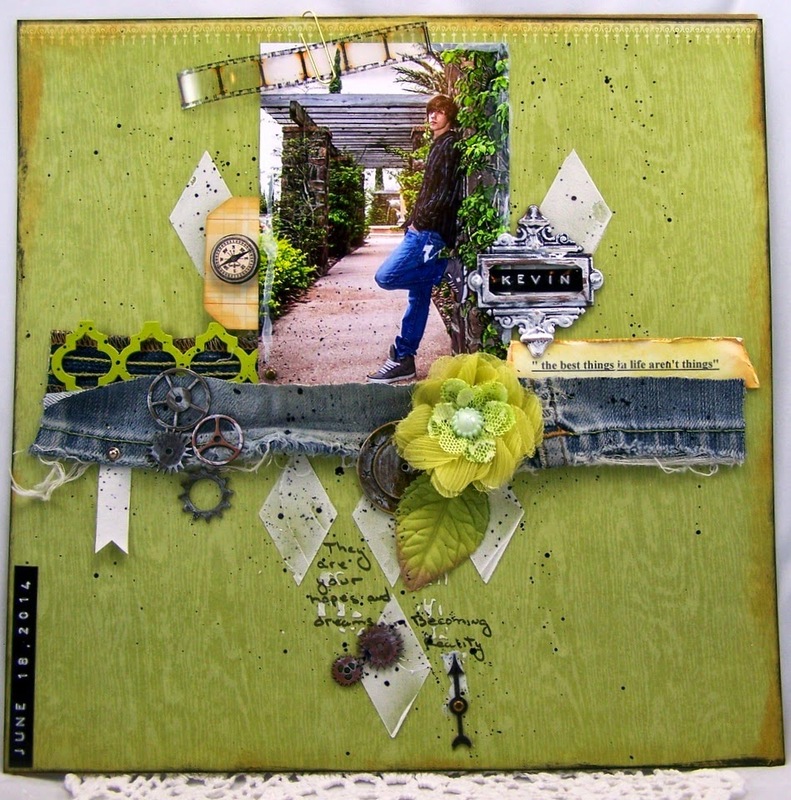 I'm playing along with our ePlay Fabric Challenge and used more of his beloved jeans! OOPS! 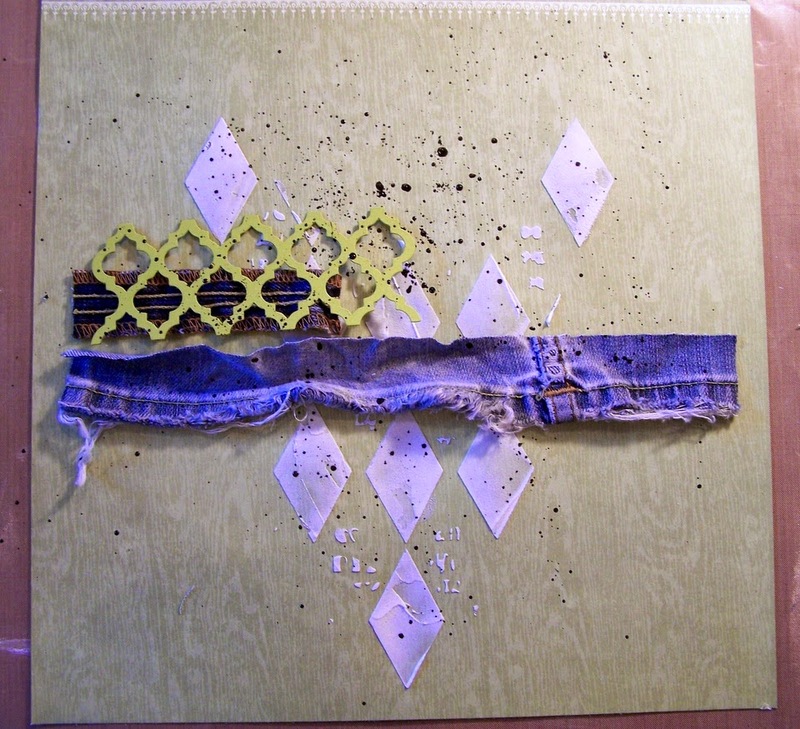 Here you can see an up close of the border I made with a frayed hem and the seam of the jeans. I tucked the seam behind th lighter jean fabric for another layer. 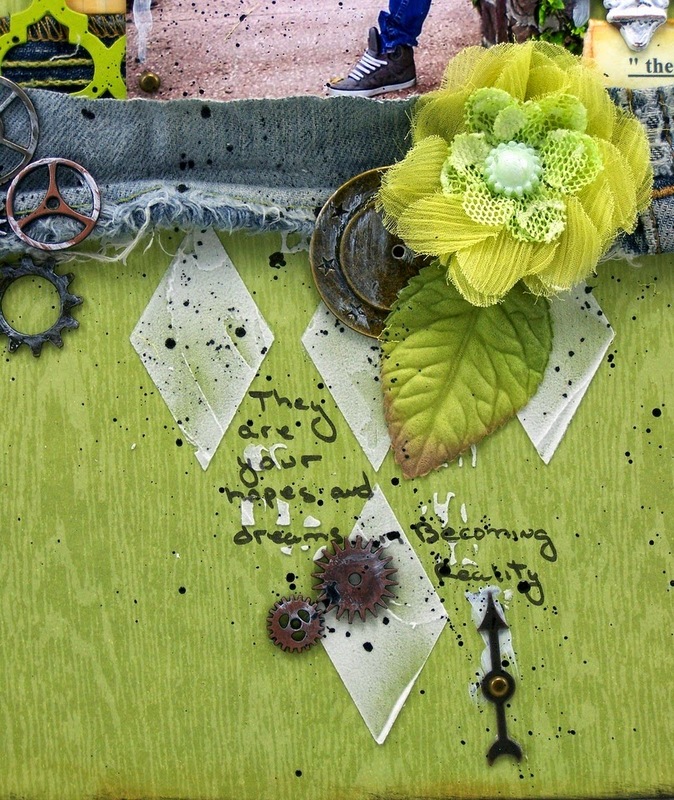 I used a piece of the Tim Holtz Trellis Die to add some color and interest. 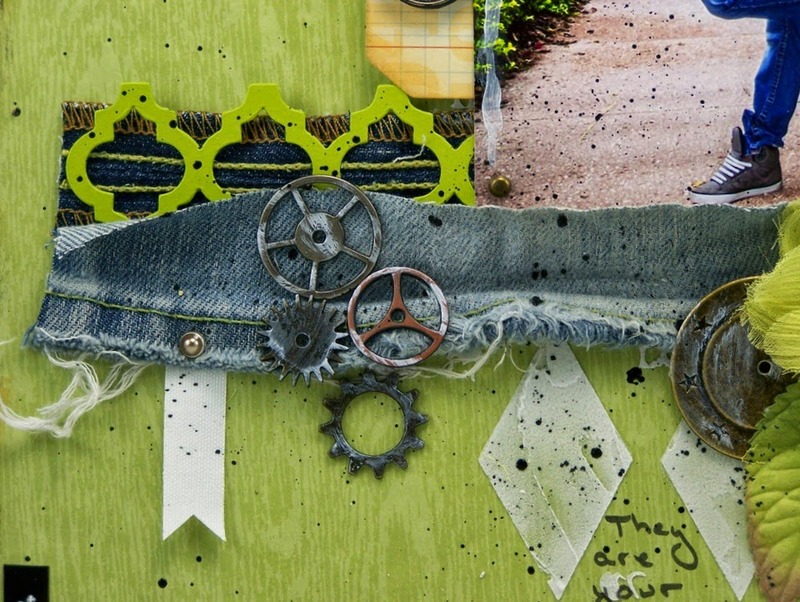 You can also see some Tim Holtz gears and a banner from Prima. His name is behind a metal frame that I swiped with gesso and sanded off for a manly look. I made his name with a dymo gun. The compass detail is to remind Kevin to take the right direction. I put private journaling on this tag and only Kevin will be able to pull it out from behind the photo and see what it says. 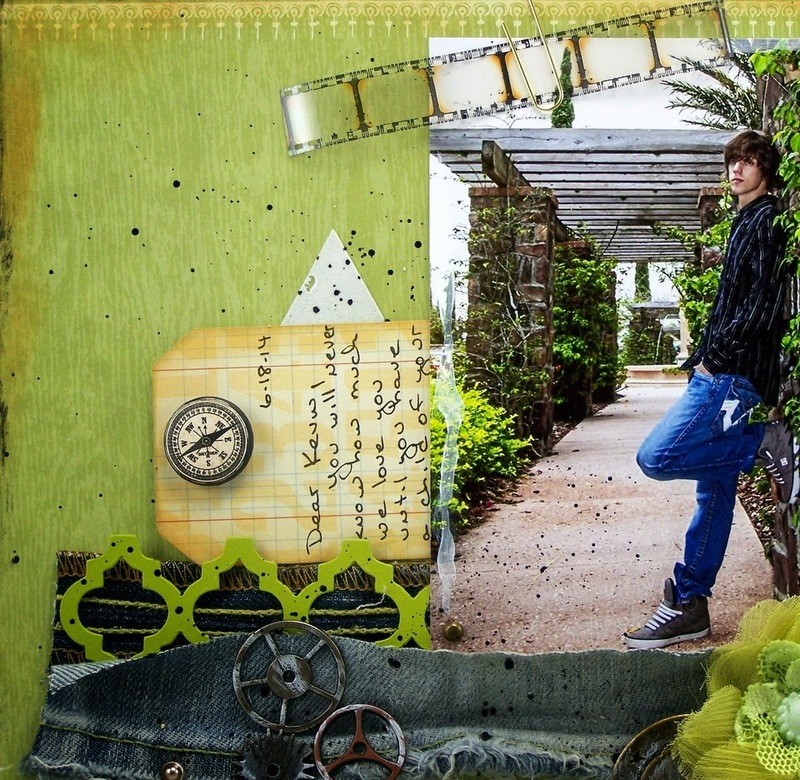 I added the idea-ology transparent film strip because it is just one of my FAV embellies! I added a secret photo behind the original photo. You unfasten the paper clip and bend the first photo down to see it. 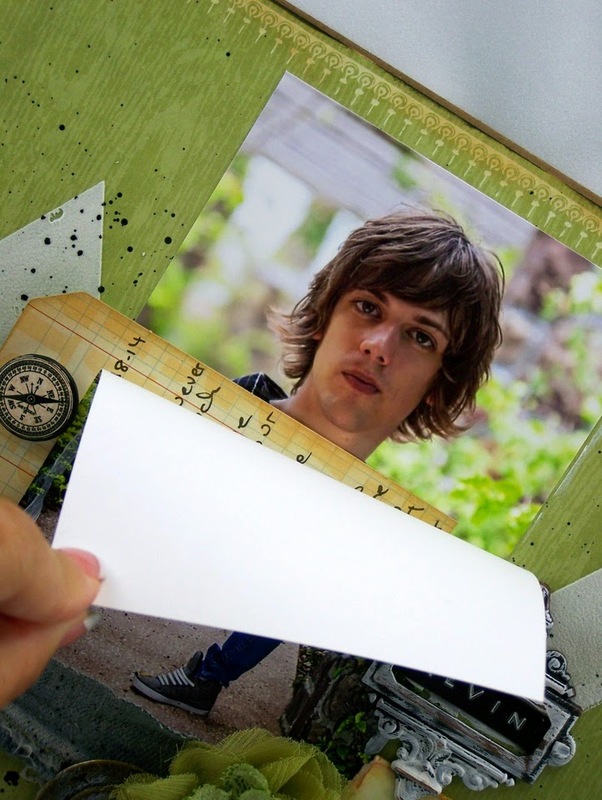 In this photo, I took the secret journaling tag out so you could see more of his face. I took a photo of the base so you could see how I started with a sheet of green (his FAV color!) woodgrain paper, applying Wendy Vecchi white embossing paste through a Prima 12 x 12 Harlequin stencil. I took Adirondack black paint and made splatters on some of the elements before I glued them down. Then I kept adding and adding elements until I thought it was done! I hope you like my Fabric inspired layout! Now come play with us at the ePlay Fabric Challenge for a chance to win a $25 gift voucher to the eclectic Paperie Shop! Totally cool layout - great use of the fabric. This is one special LO Sue! 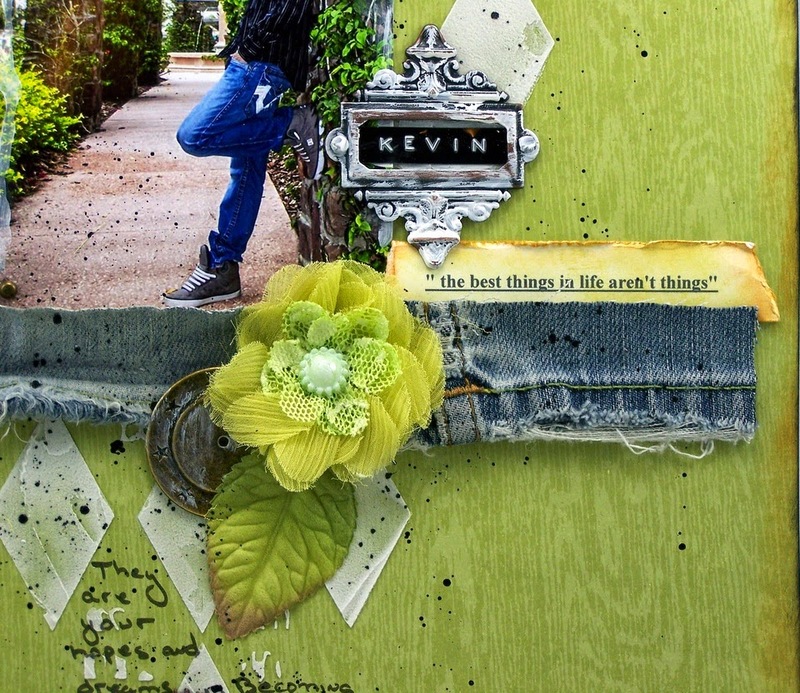 From the use of his beloved jeans, to your journaling, to the special photos of your son. Your love for him is felt throughout and he will treasure this! This is so amazing... the colors pull you in... so pretty... the elements and the details are just awesome ! What a great page for your handsome son Sue! love the jeans, the secret message and hidden photo design! Wow such a lovely page for your goodlooking son. Sure he will be proud of his mum. It's such a personalised page you created !! Thank you for sharing !! Superb creativity! its a admirable page for smarty son sue.